Thanks, Jerry - I appreciate your inputs and hard work and the other excellent posts and efforts from Leverguns folks. Going offline, now, after correcting a typo in the above post. Thanks I meant equalling factory levels but with the rifle, so getting 1250fps in a 24" barrel. But thanks for that info you posted its good to know anyway. Yes, misread first post. Sent another PM. He was one of the better ones in Hollywood. His website, authored by his wife, still states, "He continues to turn down roles that he feels are in bad taste, and when the right project comes along, Clint is ready to get back in front of the camera." Topic: Well i just ruined my morning. Re: Well i just ruined my morning. ideas that have taken root, it is hard to keep my sunny disposition! 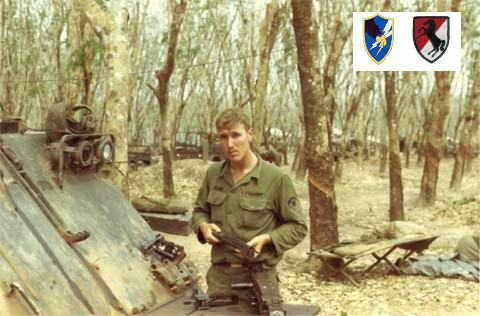 1967, Operation Junction City in the Michelin Rubber Plantation by Cambodia - VN Linguist (Army Security Agency) embedded with 11th Armored Cavalry Regiment as a Track Commander, cleaning my M50 .50 Caliber machinegun. Thank you all for your very kind words. I hope the message gets through. ...If it's someone I know they call my cell. Sorry you ended up incarcerated, Rusty. Best wishes for your early release. Here are a couple pictures from Malibu Creek State Park with some MASH scenery. So - these are relatively current photos that you took, with the old M.A.S.H. props still there?? You may be interested in seeing my updated comments dated April 8, 2018, which are added to the "Face Book" thread by Hobie in the "ANNOUNCEMENTS" section above this "General" topic section. My concerns for gun enthusiasts who advertise their names are well meaning, whether you agree with them or not. Topic: Did some shootin' today. Re: Did some shootin' today. EXCELLENT posts on this great but somewhat "high maintenance" caliber. Archived.